I appreciate your patience with the lack of posts here on F Wall Street. As you may have noticed from this comment, I had the honor of being invited to speak to the MBA students at Howard University in Washington DC on March 13th. I’m working on getting the video from that speech (about an hour long) and will post it here when I have it. Whomever controls the prices gets the money. You don’t have to be an economic guru to understand these laws. Still, not understanding them could be disastrous to your portfolio. Today, we’ll look at the first point and I’ll cover the second in a subsequent article (in less than a month – promise). When it comes to money, the markets, business, economics…everything works on supply and demand. Rather than digressing into a bunch of wild tangents, theoretical rants, and deep discussions on economics, I’ll give you the world’s greatest example of supply and demand, and how these two laws affect pricing: eBay. Even if you haven’t used it before, you know eBay – the auction website that allows you to turn the garbage in your garage into cash, or to find hidden gems on the cheap. Just recently, I purchased a brand new copy of the 2006 CRB Commodity Yearbook as my kids turned my last one into a coloring book. I could have purchased it new from the Commodity Research Bureau for $100. Instead, I bought it on eBay for $11.65. Why could I buy a $100 book and CD on eBay for just $11.65? Supply and demand. Very few people are interested in buying a copy of the 2006 CRB Commodity Yearbook (little demand) so the price is low to entice otherwise disinterested buyers to enter the market. Supply and demand is easy to understand, and you see it every day in the stock markets. When you buy a stock, you are buying it from someone else. When you sell, you sell to someone else. Supply and demand determines which way prices go. Otherwise disinterested sellers become more interested in selling at the higher prices, thereby increasing the supply of for-sale shares to meet the demand. The opposite is true when more shares are tendered for sale than there are interested buyers – sellers become less interested in selling at lower prices, and buyers become more interested in buying at lower prices. Supply and demand can get extremely out of whack for a while, which ultimately moves stock prices up and down very rapidly. We saw it happen recently with the bank stocks – Bank of America, Citigroup, Wells Fargo, and others. There was an overabundance of sellers – traditional sellers, fire-sale sellers, short sellers, naked short sellers – all trying to dump their or sell short these stocks. There was very little demand to buy these shares; so, the prices fell fast and hard to try and reduce seller interest and increase buyer demand. This was driven primarily by media sensationalism, as I pointed out in this comment as Wells Fargo crossed below $9 and every news channel was promising universal bank nationalization. Here we are six weeks later – universal bank nationalization is off the table (I don’t believe it was even on the table), things are proving to be ugly, though still better than full-blown, 1930s-style depression, and the demand for stocks outgrew the supply, pushing the markets back up. Here’s how eBay works: A user posts an item for sale and sets a starting (and possibly a minimum) price. Then, visitors bid on that item. Each bid is higher than the last until supply and demand get into balance. That is – until the price reaches a level to where the demand for that one item and that high price is exactly one. When that happens, the item goes to the highest bidder. Now, the price can be much less than what the seller hoped to get for his item; or, the item can sell for much more than what the seller had hoped to get. It happens. But…there a lesson in there: Supply and demand determine prices; hope is not an investment strategy. In a perfect world, supply and demand would be in perfect balance, prices would always be efficient, and I’d have a little more hair. Unfortunately (especially for me), the world is not perfect. Supply and demand get out of whack from time to time, which ultimately presents investors with the opportunity to profit greatly, earn anemic returns, or lose substantially. You need not look further than the dot-com bubble. In the early part of the 1990s, demand for technology companies was growing somewhat faster than the supply of great businesses. Prices increased. By the late 1990s, the demand for tech was so high that speculators couldn’t buy them fast enough. It didn’t matter whether or not the company made money – what the business was like. The supply of stocks was short relative to the demand, and prices had to rise…for a while. By the early 2000s, a bubble had formed – supply and demand were grossly out of whack and something had to give. Supply and demand, over the long-term, will always try to find their balance. To do so in tech stocks, prices hit a critical mass high, drying up the demand and, and prices began to fall, flooding the markets with supply. Of course, supply and demand don’t get out of whack only to end at a balance. Instead, think of it as a rubber band – stretching out as they get out of whack, and then snapping back. The more you stretch it, the harder it will snap back. When you let that rubber band snap back, it doesn’t usually end up as a perfect circle. Instead, it looks more like a limp noodle – partially or totally devoid of slack at all ends. Where a taut rubber band has a ton of demand (pressure) on it and very little supply (addition room to stretch), a limp rubber band has no demand and very little supply. Except in economics, the rubber band can’t break. Demand can dry up when a product or service becomes obsolete, in which case the rubber band goes away. Otherwise, the rubber band will over stretch and over shrink as supply and demand try to find balance. Why is it that some companies can increase prices with inflation while others are doomed to bad economics? Supply and demand. Coca-Cola is the only company in the world that can supply the world’s thirst for Coke, Sprite, Minute Maid, A&W Root Beer, and more than 2,700 other products. If you want a Coke, a Pepsi won’t cut it (for many people; and, the opposite is true as well). That’s why these businesses have been able to increase the prices of their products over time. On the opposite end of the spectrum you’ll find the Freeport McMoRans of the world – mining companies that have virtually no pricing power. Their profits are tied to the values of the commodities they extract and sell, as the chart below shows. Their costs are substantially fixed (though they can control costs by adding or reducing staff, starting or stopping mining operations, etc. ); so, these companies will perform well (from a business standpoint) when commodities prices are high and will perform poorly when commodities prices are low. Freeport McMoRan (FCX) can’t arbitrarily raise the price of its products because its customers don’t generally care if they’re doing business with FCX – they care about getting rock bottom prices on copper. Why is there nothing about oil companies or oil service companies on your site. These seem to have been big money makers for investors over time. Is it because these are difficult industries to follow? Why Buy The Company When You Can Buy The Commodity? Exxon Mobile. Freeport McMoRan. Alcoa. Though they may have various business lines and plans to keep them afloat when commodities prices are ridiculously low, they all share a basic characteristic: their profits and growth are highly dependant on the price of the underlying commodities in which they deal. Finally, is the price of the commodity low relative to the supply and demand characteristics? In 2008, oil nearing $150 was the peak of a bubble, as was copper at $4. Then, you have to ask yourself the truly critical question: Do I buy the companies…or the commodities? If you know that the current and near-term potential supply is extremely short relative to the demand, and you know that the price is relatively low, then you have the “what” of your equation: The price of the commodity – oil, copper, aluminum, wheat, whatever – has to go up over time (or demand has to fall sharply) until supply and demand get back in balance. In that case, if you think oil is cheap, why buy Exxon (XOM)? Buy oil! 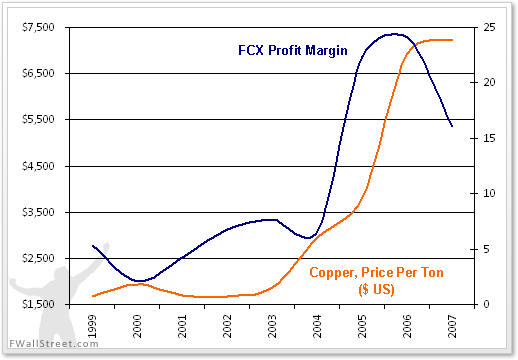 If you think that copper is cheap, why buy FCX? Buy copper! Why let the executives or securities laws or corporate tax laws screw up your investment if you don’t have to? Unless, of course, the company is a more attractive versus the commodity. If I think oil is going to $70 a barrel, I’d rather buy the commodity at $52 than XOM at $70. At $70 a barrel, the commodity is worth $70 while XOM might only be worth $85 – the difference between a 35% return in oil versus a 14% return in XOM. That said, in the same scenario, I’d take XOM over oil if I could get XOM at, say, $50. That depends on how you approach them. Day-trading commodities is risky, as is day-trading stocks. With commodities, the risk can be magnified by insane amounts of leverage, moreso than is allowed with owning stocks. If you’re a long-term investor, and if you have a good idea of what will happen even though you don’t know when it will happen, owning commodities is no more or less risky than owning stocks. Remember: volatility is not risk. Risk is in the strategy, not the security. I’m not suggesting you open a futures trading account. Instead, if you see supply and demand out of whack in a commodity, look for an exchange traded fund (ETF) that deals in that commodity. You can buy and sell it like a stock, but don’t have to worry about having a different account, settling your futures on a daily basis, backwardation and contango (generally, if you’re a long-term investor), and the myriad of other commodities headaches that scare and confound inexperienced futures traders. Yesterday, I added 694 shares (10%) of The PowerShares DB Base Metals Fund (DBB) to the F Wall Street portfolio. An investment in DBB is a passive investment in aluminum, zinc, and copper. I’ll get more in depth about the whys of aluminum, zinc, and copper in another post; but, here’s the rationale: If I think that copper prices are going to rise 50%, why buy FCX – a company that would generate a 20% profit margin on those 50% higher prices? Why not take the 50% for myself? Obviously, my investment in DBB says this: I believe that demand for aluminum, zinc, and copper will be much higher than the current and near-term supply capabilities. My 10% investment is not a 10% investment in each of these metals; rather, the metals are split evenly in thirds. My investment, therefore, is a 3.33% investment in each of the three metals. When supply and demand are out of whack, prices change – in stocks, in commodities, on eBay. In the short-term, this can lead to massive bubbles and gut wrenching bursts. In the long-term, however, supply and demand will always try to work towards a balance, and the best way to balance them is by raising or lowering prices. There is no better way to entice people to increase supply and to contemporaneously reduce demand (ie, help bring supply and demand back into balance) than by increasing the price of the item in demand. This is a law that can’t be broken. If you have a grasp on the supply and demand characteristics of your investments, and if you understand the second unbreakable law (whomever controls the prices gets the money), you’ll have almost everything you need to figure out what will happen. What would you do differently if you knew precisely what would happen, even though you didn’t know when it would happen? Before implementing the Facebook comment system below, visitors would register and post comments directly on F Wall Street. This article had 18 comments which you can view here.